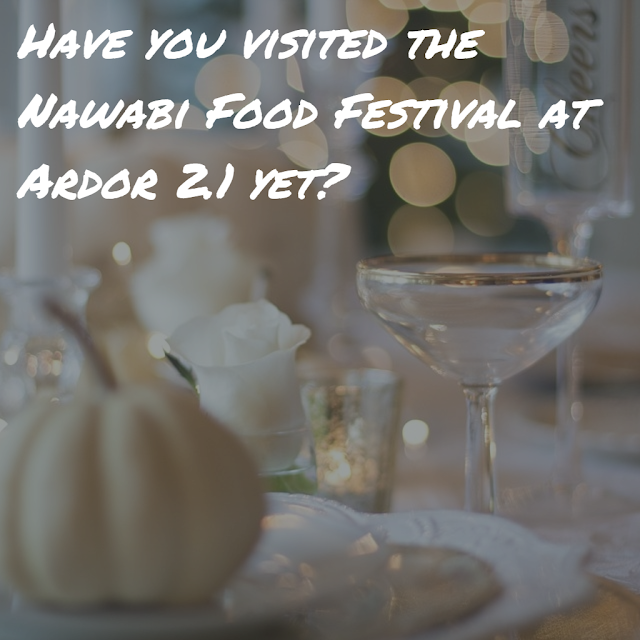 Have you visited the Nawabi Food Festival at Ardor 2.1 yet? 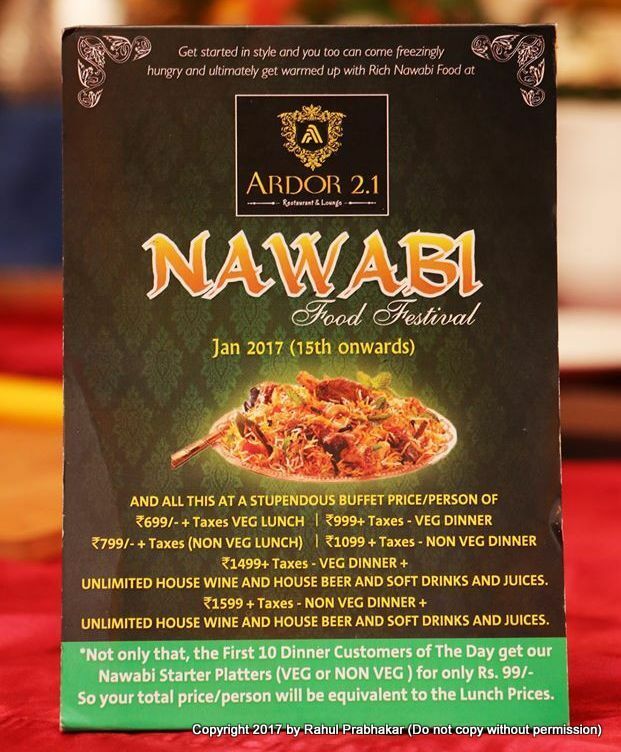 In this blog post, I cover the Nawabi Food Festival, underway at Ardor 2.1 Restaurant and Lounge in Connaught Place, New Delhi, from January 15 to April 30. 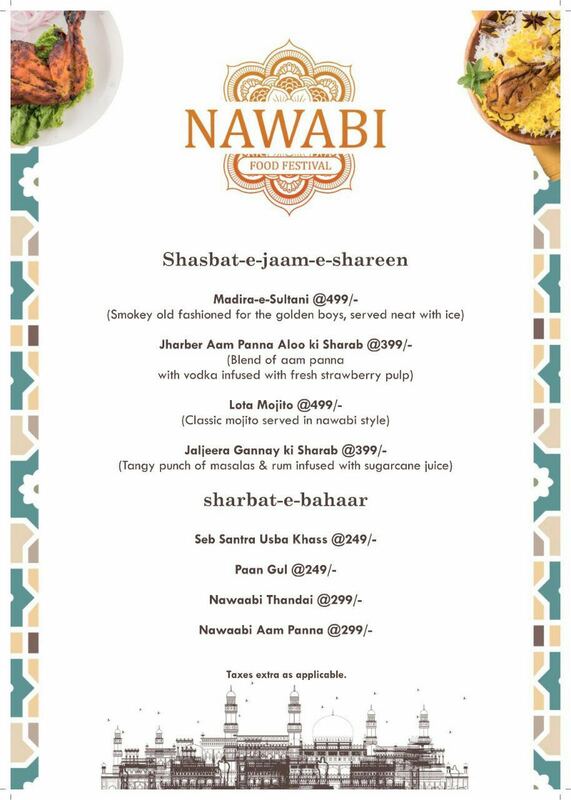 The Nawabi Food Festival introduces recipes from the royal fare to the discerning foodies of Delhi-NCR, by curating some of the best authentic dishes from the Awadh region. This festival provides an amazing opportunity to explore a lavish Nawabi spread which includes richly marinated kebabs, slow-cooked biryanis, aromatic and spicy gravies, and much more - with the same culinary richness that one would expect from the region. If you too are planning to be a part of the Nawabi Food Festival anytime soon, I'll offer my top 10 recommendations on why you should visit this culinary retreat. 1. First, the price point is a huge incentive for both vegetarians and non-vegetarians alike. If you're a vegetarian, pay INR 699 plus taxes (per pax) for buffet lunch or INR 999 plus taxes (per pax) for buffet dinner. You can even pay INR 1499 plus taxes (per pax) if you wish to combine the buffet dinner with unlimited House Wine/House Beer/Soft beverages. If you like meat, pay INR 799 plus taxes (per pax) for buffet lunch or INR 1099 plus taxes (per pax) for buffet dinner. You can even pay INR 1599 plus taxes (per pax) if you wish to combine the buffet dinner with unlimited House Wine/House Beer/Soft beverages. The excitement doesn't end there; the first 10 customers who opt for buffet dinner every day get Nawabi Starter Platters (vegetarian/non-vegetarian) for INR 99 only. Now that is good value for money! 2. 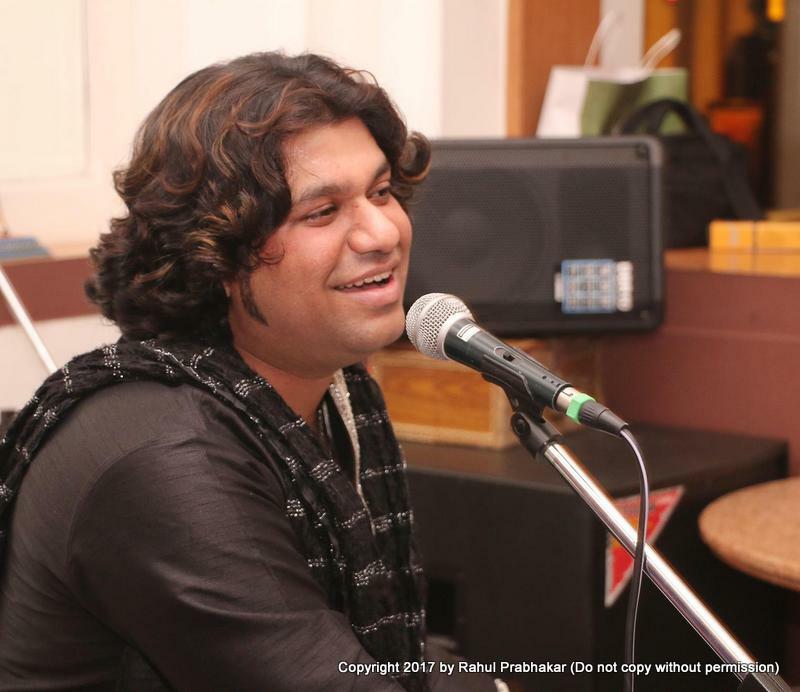 Enjoy the best Mughlai delicacies while immersing in live Sufi music performance, courtesy Sameer Khan Niazi (singer) and Aamir Salim (on Tabla and Percussions). 3. One lucky couple who attends this festival gets to win a fully sponsored trip to Agra worth INR 60,000. Enjoy a limousine r⁯ide to Agra, a visit to the iconic Taj Mahal, plus an extravagant lunch in a five-star property! 4. The Nawabi Food Festival offers a wide array of exotic royal drinks like the Seb Santra Usba Khass, Paan Gul, Nawaabi Thandai, and Nawaabi Aam Panna. Madira-e-Sultani - A smokey old fashioned served neat with ice. Jharber Aam Panna Aloo ki Sharab - Blend of aam panna in vodka infused with fresh strawberry pulp. Lota Mojito - Classic mojito served in Nawabi style. Jaljeera Gannay ki Sharab - Tangy punch of masalas and rum infused with sugarcane juice. 5. Craving for a classic Mughlai feast? Try the burra kebab made from mutton ribs, not shanks. 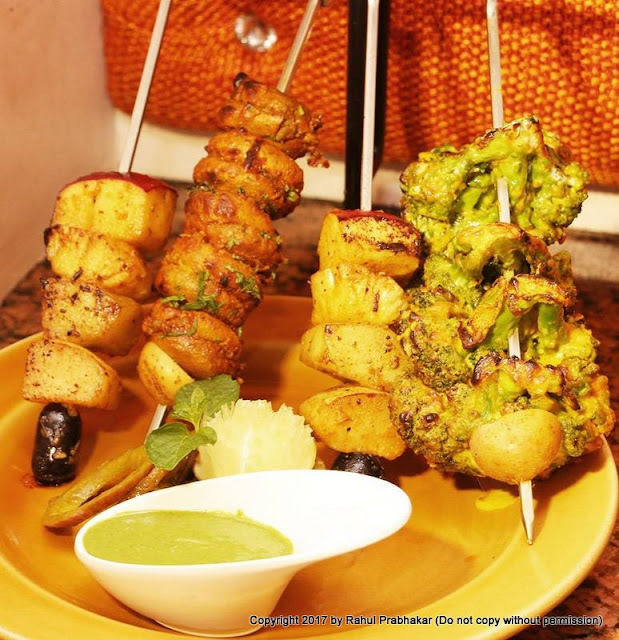 Yet another example of pure innovation, these kebabs are perfectly marinated, skewered, roasted, and charred in a tandoor; coming out as tender, spicy, and smoky meat. 6. The Gosht Biryani is literally to die for! During the preparation of this delectable recipe, the gosht (red meat) is soaked in ghee overnight. Next day, the gosht and rice are slow cooked for nearly eight hours, as a result of which, the gosht doesn't lose its tenderness and the rice isn't sticky or dry either. The flavors, in fact, are so well balanced that you don't mind an extra serving. 7. The Mutton Galouti is Ardor's way of choosing to honor the culinary talent of Khansama Galouti, who held the kitchen for Nawab Wajid Ali Shah, the tenth and last Nawab of Awadh. It is believed that during his declining years, Nawab Wajid Ali Shah requested the Khansama to prepare a dish that he could easily chew. And that's how the superbly tender, melt in your mouth galouti kebabs were invented. 8. Among the starters, try the Laal Mirch Bhunna Chooza (non-vegetarian) and Subz Khoya Kaju Kurukuri Tikki (vegetarian). The former is prepared using tender pieces of boneless chicken breasts, while the latter is a unique blend of dry fruits, khoya (a dairy product), cheese, and potatoes. 9. 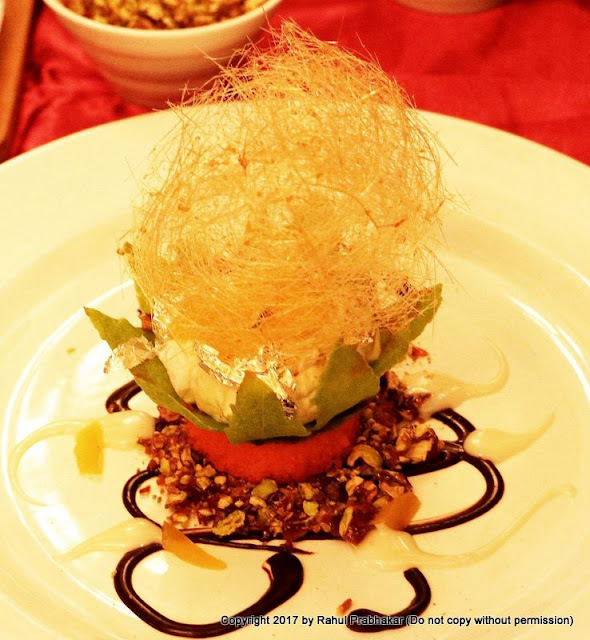 The desserts are another highlight of the Nawabi Food Festival. My favorites include Shahi Tukra, Rajwada Meva Halwa, Kulfi with Rabri, and Anek Falon ka Sundae Dessert. 10. 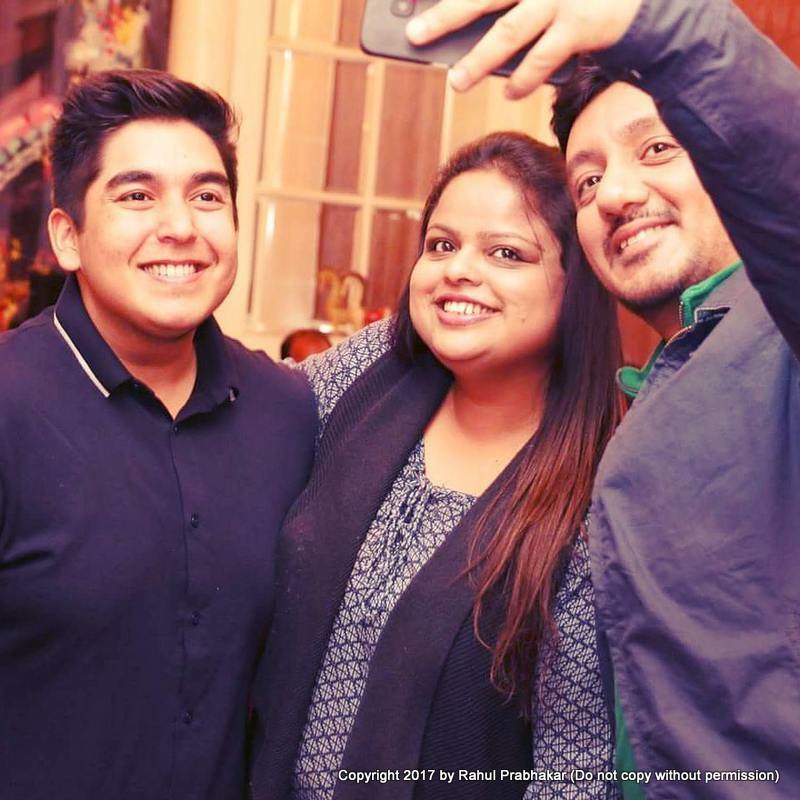 The festival is already garnering media attention after Chef Dinesh Patel (of MasterChef India Season 5 fame) and Chef Rakhee Vaswani (a celebrity chef, culinary expert, food consultant, author, and entrepreneur) decided to associate with the ongoing festival at Ardor 2.1. Chef Dinesh even conducted a masterclass in presence of top Delhi-based food bloggers on February 27, where he prepared a sumptuous special dessert called "Seasons of Splendour", a mousse inspired by the khubani (apricot) halwa, filled inside a beautifully shaped tuile biscuit with layers of orange gel and rose sponge. The dessert rests on a white chocolate garnish and rose syrup, as well as a bed of pistachio praline and a flurry of golden spun sugar. So there, what are you waiting for? 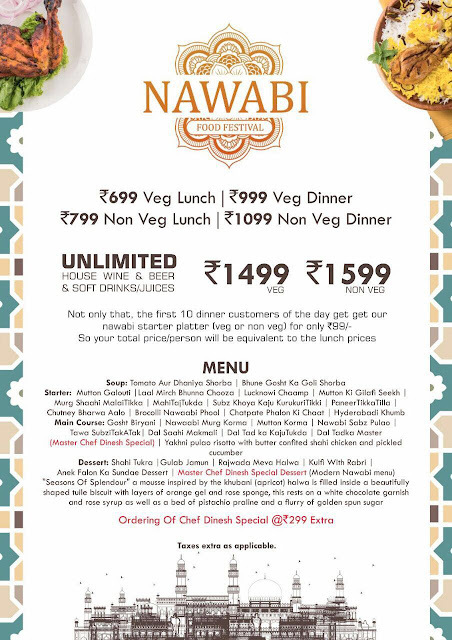 Come, be a part of the Nawabi Food Festival and relive the royal legacy yet again!